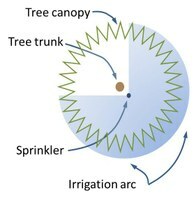 While landscape irrigation continues to be regulated, providing water to trees during the drought in a manner that provides an adequate amount of water without waste can be difficult. 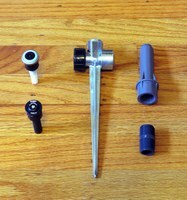 A previously suggested method using in-line drip tubing can do this with reasonable precision, but the cost of purchasing the parts to assemble is about $100 or more (see TRIC at http://ccuh.ucdavis.edu/tric). The method described here can also irrigate a tree in a lawn for much less (about $20), but requires more involvement of the user. This “device” uses a multi-stream rotary sprinkler to deliver water instead of the in-line drip tube. The sprinkler is mounted onto a spike that is pushed into the soil and attached to a hose. The soil type needs to be determined, since that is the main factor in determining the run time. Multi-stream rotors apply water more slowly than fan sprays, but there is still potential to create runoff, so they need to be monitored. If runoff occurs, the water should be shut off and the water should be allowed to soak in before resuming irrigation. Remember to turn the hose off, too. An irrigation timer has not been included to keep the cost down, but you can purchase one from $15 - $30. The device uses a water pressure regulating riser (pressure regulated shrub adapter) onto which the sprinkler is mounted. The pressure is regulated down to 30 psi, so this means that the water source needs to have pressure in excess of 30 psi. The sprinklers suggested are adjusted to cover an area of 270°, three quarters of a circle. It doesn’t cover the entire area under the tree, but should be adequate. The tree should be located in the open part of the circle so that the trunk isn’t watered, since water on tree trunks can promote disease.